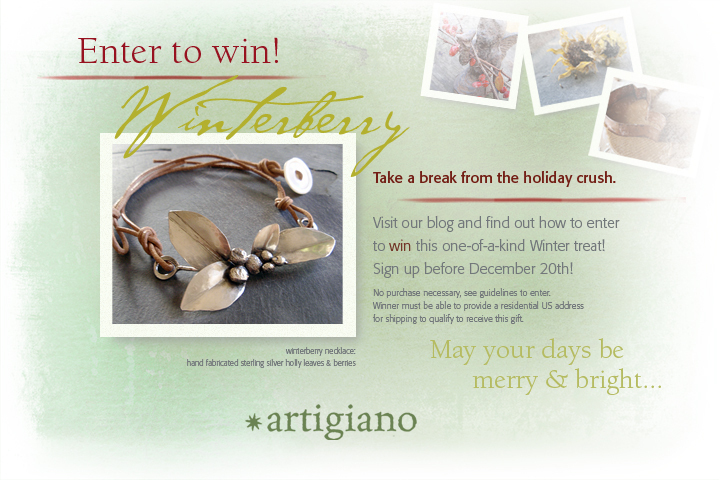 In celebration of Christmas and all the wonderful winter holidays, I’ve created this special one-of-a-kind winterberry necklace exclusively to offer here as a giveaway from our Artigiano blog! The hand fabricated silver leaves and berries are inspired by a huge holly bush that held a prominent position in our garden border through many years of holiday seasons, all the while providing festive boughs to decorate our home. 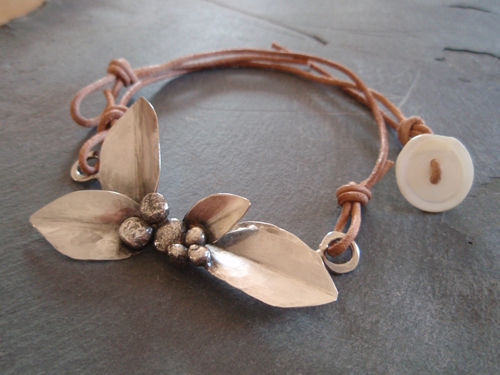 This everlasting sprig makes a dramatic necklace ($185.00 value), knotted on a rustic leather choker with a closure made from a vintage mother-of-pearl button. The necklace is about 16″ long, and I’ve left a bit of extra leather cord in the back so that it can be extended a bit if needed. Sign up here for our e-mail list! (not necessary if you are already on the list). We send only occasional messages or updates and do not share our list with any other businesses. Want to double your chance of winning? Come back to this article and submit another comment below, indicating which favorite article you have commented on and that you would like to be included in the drawing a second time and you will qualify for 2 chances. Fulfill these guidelines and you will have a chance (or 2) in the drawing, to be shipped to a lucky winner the week leading up to Christmas. Note that the necklace will only be shipped within the US only so please have a US residential address to qualify to receive the prize. The winner will be notified via e-mail December 20th and I’ll request your shipping address then. Claim your prize and it will be shipped out right away with delivery confirmation! I’m happy to offer this drawing with special thanks to all who have encouraged and supported Artigiano this year! All the amazing comments and feedback, the continued support of my wonderful local customers and friends, as well as the warm welcome from the Etsy community of artists, treasury makers, and micro business supporters continue to make this endeavor a delightful and hopeful experience. Good luck… and warm wishes to you this special season! Congratulations! Carla (cbc) is our Winterberry Winter! Your necklace is NYC bound! Thank you to everyone who posted and participated in our very first Giveaway! I love this piece…such a pretty addition to your growing collection of creations! A beautiful addition to your art! I love the work you do, and feel privledged to have seen so many aspects to your artistry, from fine art to graphic design to your beautiful jewelry… keep it up! Andrea, your work is always lovely. Over these many years I have enjoyed your father’s artistry and now yours. Have a Blessed Christmas! Beautiful necklace! …which reminds me… All of my friends love the heart necklace you made that my parents got me for my birthday! (((And I very much adore it as well, of course:)!! ))) You have fans far and wide. I, too, love this piece. 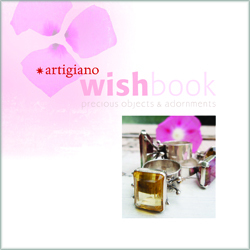 My Aniello/Artigiano collection has evolved over the past 35 years. From my first piece from my new boyfriend, Art, to our wedding bands, then the piece I bought for myself in October, and everything in between-all worn with love and appreciation, and they carry with them many fond memories. beautiful piece! it’s so pretty i wonder if it might bring more holiday kisses than standing under the mistletoe! Yes, I WOULD like a second chance, sure, why not. And yea, that really is a gorgeous piece. I commented on the quince post. 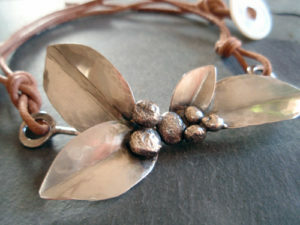 I’ve had the good fortune to see this lovely winterberry piece in person sitting in Andrea’s workshop. That’s when Andrea explained to me about the holiday giveaway. It IS as beautiful as shown in these photographs. Thanks Andrea, for allowing me the opportunity to win one of your beautful works of art. I love your jewelry and your creative passion! Your work is “Beautiful” as always! Holiday Blessings To All! Gorgeous – as always!! – simple to say and its always true. Great idea too. Wishing you much success with your blog. And good holiday cheer to you too! Beautiful work! I commented on “blackbirds”, these pieces really sing to me. 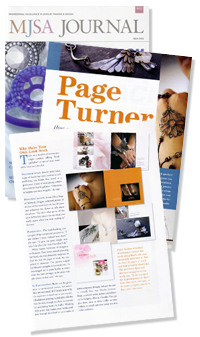 Who would have thought all those many years ago when dad made those cookie cutters that one would show up on your blog. Aniello Designer Craftsman is still being creative thru your work. The Winterberry piece is absolutely gorgeous! I purchased the Blackbird necklace from your Etsy shop about a month ago, and it’s absolutely beautiful and beautifully crafted! One of my favorite pieces of jewelry (when I do wear jewelry)! I’m sure the Winterberry piece is crafted just as beautifully. The photography on your blog is beautiful — I’ll have to stop by more often! I’ve also posted a comment to the “Overwinter” entry. I thoroughly enjoyed reading your post WELCOME. Fascinating story. Thank you for sharing. What a wonderful little store front. Would have loved to have seen it in person. Thanks for adding me to your giveaway a second time and thank you for this amazing opportunity! I commented on your latest post (right before this one) Wintery Day. I have a backyard full of evergreens, yet I’ve never used any part of them to make something, which is a bit odd. You have a great talent with metal – your pieces are so beautiful! Thank you so much to everyone who has posted and gotten in touch! The necklace is on it’s way to Carla, our winner, who found us by way of Etsy. I can’t wait to see what she thinks! Don’t forget to check in with the blog again and see what’s new! Andrea, I received the necklace…really, like a flash!!! It is truly outstanding! I LOVE it. (.. still can’t believe I won something so beautiful!) Your designs and craftsman-ship are out of this world, you have made my Holiday! ( & I won’t be taking it off any time soon, either.) I hope to add to it soon, I have my eye on your beautiful wings to keep it company. Have a Beautiful Holiday and keep up your wonderful blog, it’s inspiring.